Discover the historical past and the cosmopolitan present of Lisbon. In Lisbon, on the corner of the Avenida da Liberdade with the Largo da Anunciada, is a beautiful 18th century building, sober and discreet in its architectural style, which is home to the charming hotel Heritage Av Liberdade. On this square there used to be a Monastery for Dominican nuns and the Palace of the Ericeiras, both destroyed by the 1755 earthquake. The Ericeiras were the proprietors of a large part of the land that gave rise to the Passeio Público, the current Avenida da Liberdade, and the hotel’s building. The refurbishment project was conceived by Miguel Câncio Martins, the Portuguese architect famous for his interventions at the Buddha Bar in Paris, Strictly Hush in London and the Man Ray in New York. The building’s 18th century façade was kept, as well as the masonry and the railings on the balconies. Inside, the Pombal age tiles, the wooden portals and pieces of antique furniture were restored. The outcome is a comfortable and refined environment with a cosmopolitan feel. 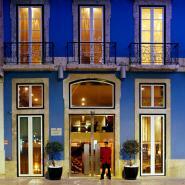 Located in the heart of Lisbon’s historical centre, the hotel is very close to the city’s typical areas. Walk down the avenue in the direction of Rossio and Chiado, climb the hills into the Bairro Alto, Alfama or the São Jorge Castle that has watched over the city for centuries. Coming from the Airport, follow the directions to Santa Apolónia and Praça do Comércio. At Praça do Comércio turn right and go straight ahead till Rossios’ Square. Passing Rossios’ Square turn on your right-hand side at Restauradores Square and go up Avenida da Liberdade. On the second traffic light you’ll find the Heritage Av Liberdade hotel. "Very nice hotel. The staff was very friendly and helpful. Regards." "An elegant boutique hotel with the perfect touch for a stylish weekend." "Right on the main street of Lisbon, this sleekly modern hotel in a restored late - 18th-century palace opened its doors in 2006. One of Lisbon’s newest hotels is also one of its best, the decoration created by famed architect Miguel Câncio Martins, known for such landmarks as the Buddha Bar in Paris." "Câncio Martins was responsible for the architecture and the interior design bringing together an atmosphere which evokes the Portuguese way of life today." "Portuguese architect Miguel Câncio Martins did a masterful renovation of this 18th century building to a modern boutique hotel while maintaining its ancient character." "Housed in a full renovated, graceful late 18th-century building."